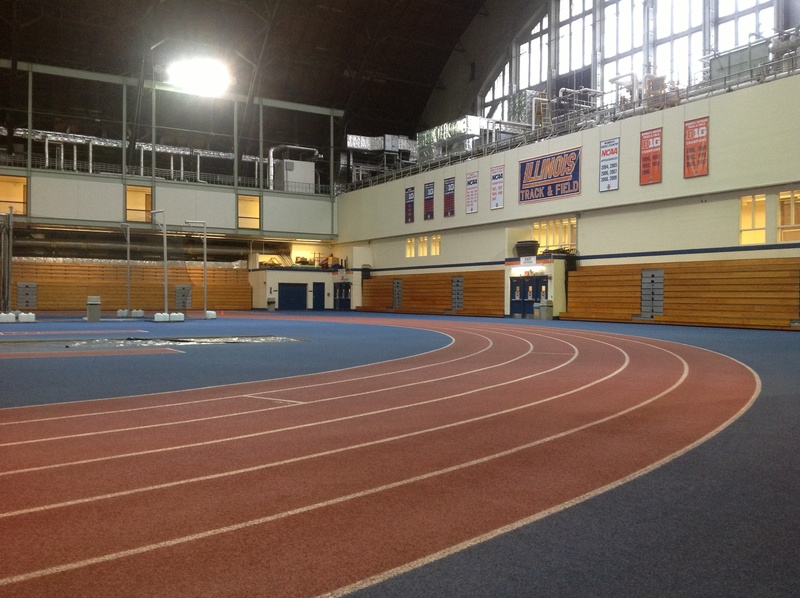 This winter I’ve been running on the Armory track at the University of Illinois. The last time I used a track was in high school. Back then I was quite a bit faster. Now days I plug along at a 10 minute per mile pace. I am obviously not out to impress anyone, especially members of the UofI’s men’s or women’s track team who run circles around me during their practice. But it’s a pace that I’m able to maintain, at least for a while. There are benefits to running on a track, and there are a lot of things about running on the streets of Champaign that I don’t miss: Traffic, car exhaust, stop lights, curbs, potholes, imbalanced dogs, angry geese, angry people, extreme temperatures, and those darn concrete slabs! When the weather warms up, I will once again take my place among Champaign’s outdoor runners. But I doubt this will last for long. As soon as the temperatures reach into the 90s, and we start experiencing high humidity, it’s back to the track for me!